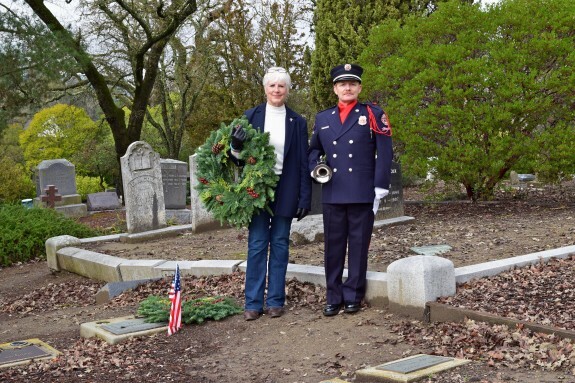 San Ramon Valley Republican Women Federated (SRVRWF) is sponsoring the Wreaths Across America project at the Alamo Cemetery on El Portal in Danville. On Saturday, December 12th at noon, we invite the community to join us as we place holiday wreaths on the graves of all veterans buried in the Alamo Cemetery. This year with the help of partner organizations Alamo Women's Club, Alamo Rotary Club, Alamo Municipal Advisory Council, Danville Area Chamber of Commerce Ambassadors, Rossmoor Republicans, SRV Historical Society, Mt. Diablo Chapter DAR, and Veterans Organization's in Danville, we have 100% sponsorship of wreaths to be placed on 105 Veterans graves at the Alamo Cemetery. The funding was completed in 45 days.